This story was updated at 5:11 a.m. EST. A NASA spacecraft zipped close by comet Tempel 1 late last night (Feb. 14), keeping a cosmic date that wrapped up an out-of-this-world Valentine's Day. The Stardust-NExT probe flew to within 112 miles (181 kilometers) of the comet at 11:39 p.m. EST (0439 GMT today), snapping photos and making measurements all the while. It took mission scientists until midnight EST to confirm the successful encounter because of the communications lag between the probe and Earth. The spacecraft's high-resolution images began arriving on scientists' computers around 3:55 a.m. EST (0855 GMT) today. Researchers had wanted the first photos to bracket the spacecraft's closest approach, but a glitch prevented that from happening. The first Tempel 1 pictures scientists saw were the first ones Stardust-NExT took during the rendezvous, when it was about 1,600 miles (2,575 km) away from the comet. The closest-approach photos will roll in, officials said — it'll just take a few more hours than expected. "They're not lost, and the targeting is quite good," said Chris Jones, associate director for flight projects and mission success at NASA's Jet Propulsion Laboratory in Pasadena, Calif.
Comet Tempel 1 is no stranger to robotic visitors from Earth. In July 2005, another NASA probe, known as Deep Impact, smashed an 800-pound (364-kilogram) impactor into Tempel 1 to study the comet's composition. The 3.7-mile-wide (6 km) Tempel 1 has an orbital period of 5 1/2 years, so it had made one trip around the sun since Deep Impact's visit. Stardust-NExT's main mission is to help scientists learn how much the comet has changed during this time. Researchers also hope to get a good look at the crater Deep Impact pounded out of the surface; the Deep Impact probe was not able to see it well through the huge cloud of debris ejected from the blow. Another aim of the Stardust-NExT mission is to extend geologic mapping of Tempel 1's surface, adding to the work done by Deep Impact. "We've never gone back to a comet," said Ed Weiler, associate administrator for NASA's science mission directorate. "This is the first time in human history that we've had that opportunity." Through these and other observations, Stardust-NExT can contribute to scientists' understanding of how comets formed at the solar system's birth 4.6 billion years ago and how they have evolved, researchers have said. After more than three years of preparation, Stardust-NExT — streaking through space at about 24,300 mph (39,100 kph) — approached the comet and snapped 72 high-resolution images. The probe began beaming its photos back to Earth about four hours after the closest approach. Researchers expected the first photos they received to be the five taken when Stardust-NExT was closest to Tempel 1. But for reasons that remain mysterious at the moment, the craft instead sent its pictures in the order in which they were taken. "They represent the approach sequence," Jones said. "We still don't understand fully why this didn't work as planned." The problem is a glitch, not a disaster. Stardust-NExT didn't lose any pictures; the best ones will just take a little longer to reach scientists' computers. NASA had scheduled a press conference for 1 p.m. EST (1800 GMT) today to discuss the flyby and some early science results. But that has been postponed until 4 p.m. EST at the earliest, officials said, to give scientists time to analyze the closest-approach photos. At this stage, all indications are that the rendezvous was a success, and excitement flowed through mission control at JPL as updates came in from the spacecraft. "Everything is working wonderfully well," said Joe Veverka of Cornell University, Stardust-NExT principal investigator. This was not Stardust-NExT's first comet rodeo. 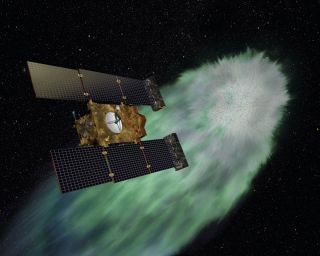 The probe began its life as the Stardust spacecraft, which launched in February 1999 on a mission to collect dust and gas from around comet Wild 2 and send the sample back to Earth. Stardust completed that mission when its return canister landed in the Utah desert in 2006. Since the orbiting spacecraft was still in good shape and had a fair bit of fuel left, NASA gave it a new mission in 2007 — to rendezvous with Tempel 1. The probe was rechristened Stardust-NExT (for "New Exploration of Tempel"). The bonus mission is a bargain, NASA officials have said, since it takes advantage of an asset already in space. It cost about $300 million to launch and operate Stardust through the end of its mission. Stardust-NExT's total cost, on the other hand, should be $29 million. Stardust-NExT is a survivor, having already logged about 3.5 billion miles (5.7 billion km) in space. But this should be the last comet encounter for the probe, since it has probably burned up almost all of its remaining fuel chasing down Tempel 1, researchers said.